Do you ever make a meal and you want to call all of your friends and family to come over to eat it right away? That’s how I felt about this one. 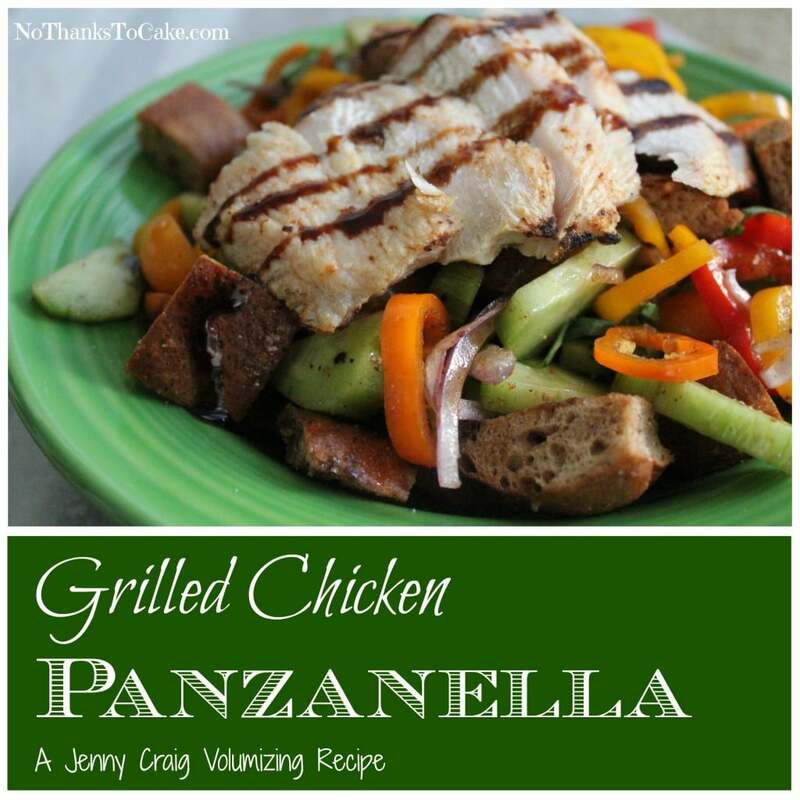 I’ve always loved a panzanella salad… When I see it on a menu, I swoon. 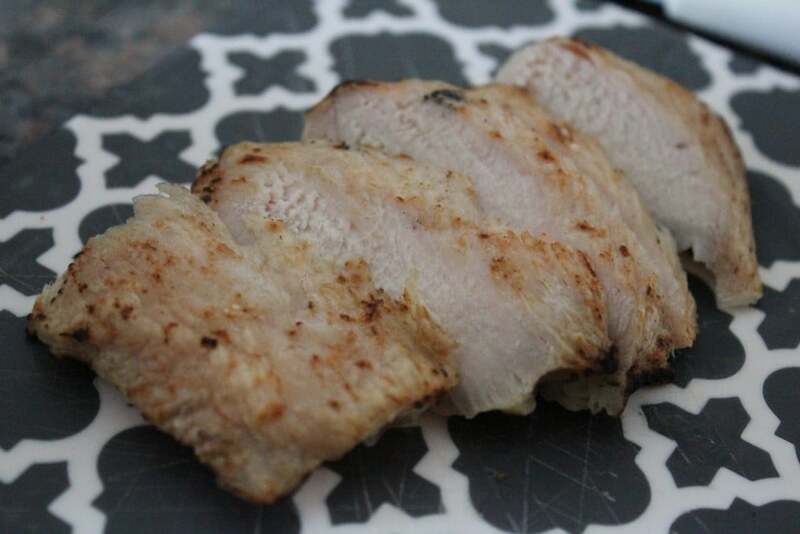 When I see it in a cookbook, I drool. 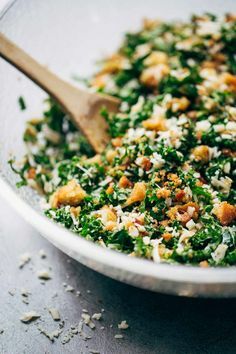 It’s just a decadent, filling salad with all of my favorite veggies and big croutons! 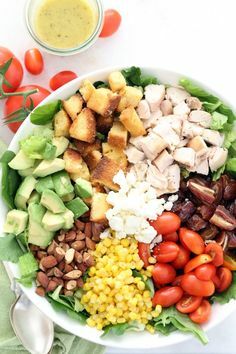 I especially love the version of the salad I’m sharing today because I can enjoy it and stay 100% on track with my Jenny Craig program. 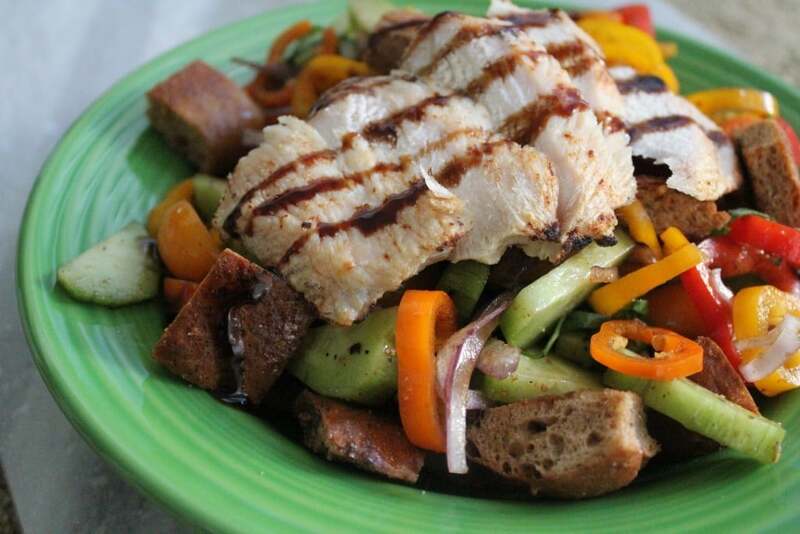 If you’ve never had this italian bread salad, get yourself ready. You’re going to be hooked. Reflecting on this salad, I truly feel like this chicken sandwich had always dreamt of becoming panzanella. The toasty croutons, the tangy dressing, all the crunchy fresh veggies… it is going to knock your socks off, y’all! 1. 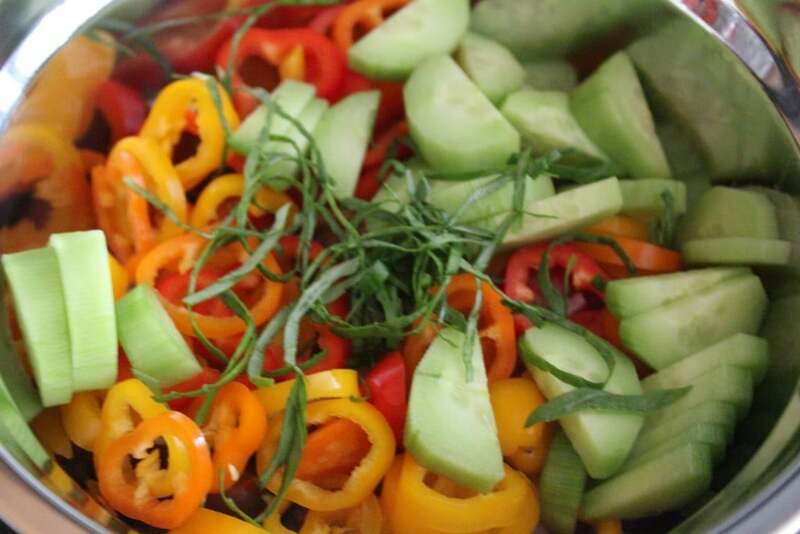 Slice your cucumbers, tomatoes, onions, and peppers. 2. 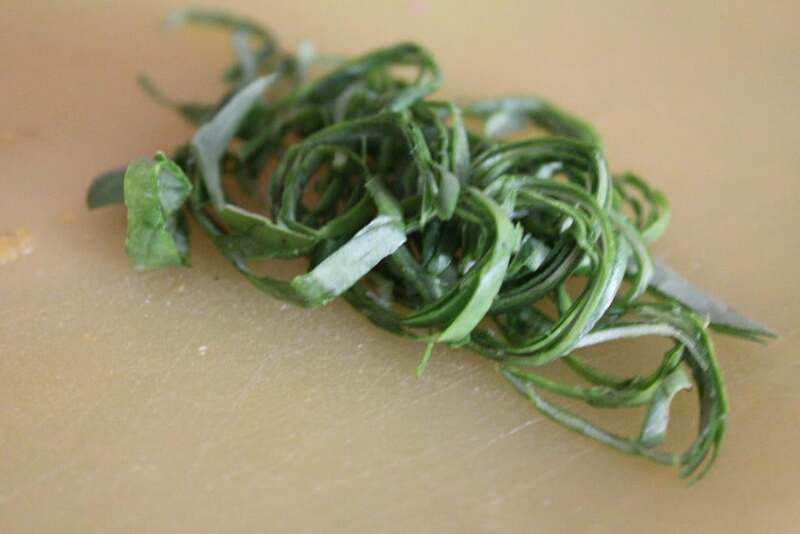 Slice your basil chiffonade-style. 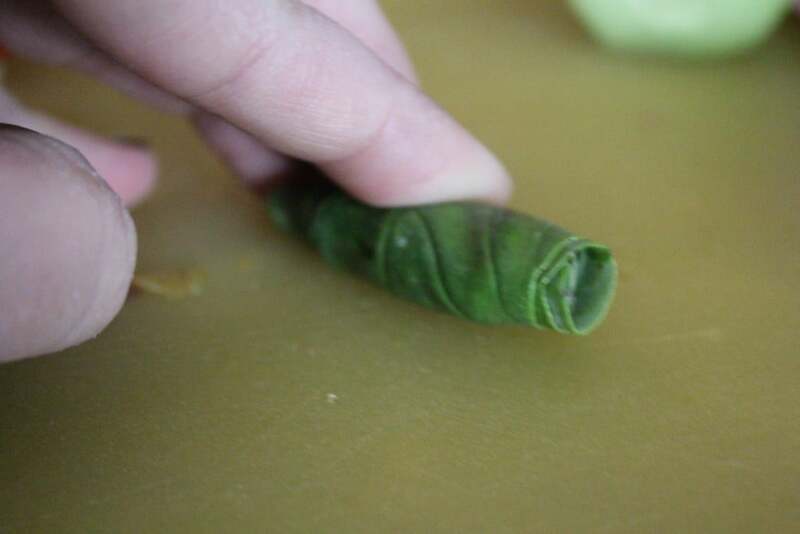 Note: Roll leaves of basil in a stack and then slice very thinly to create tiny ribbons of basil. 3. 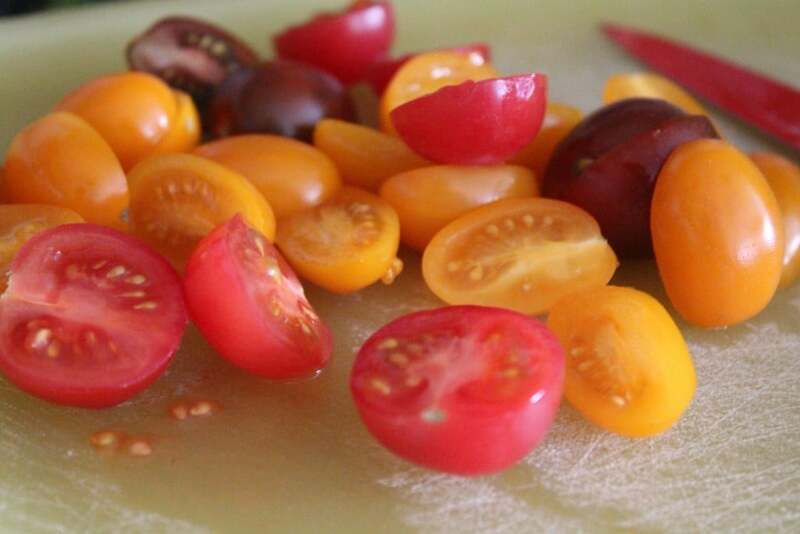 Combine veggies in a medium bowl. 4. Defrost your bun by cooking it for 30 seconds in the microwave wrapped in a paper towel. 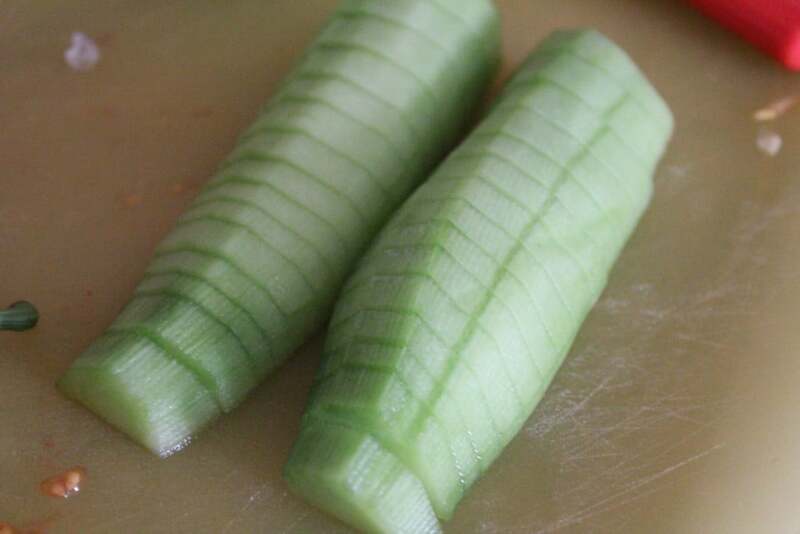 Remove it from the microwave, and cut into crouton-sized squares. 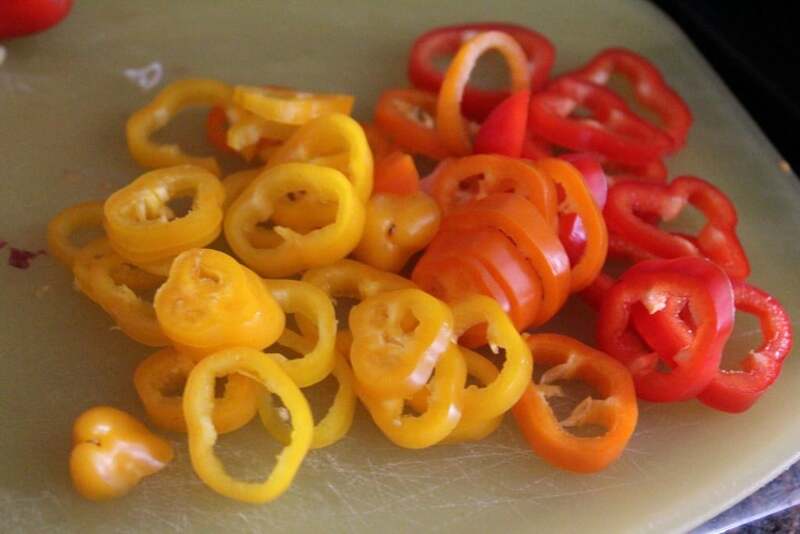 Spray lightly with cooking spray and toss in garlic powder (as much as you’d like) and a sprinkle of pepper and salt. Note: I added a sprinkle of pizza seasoning here too. 5. 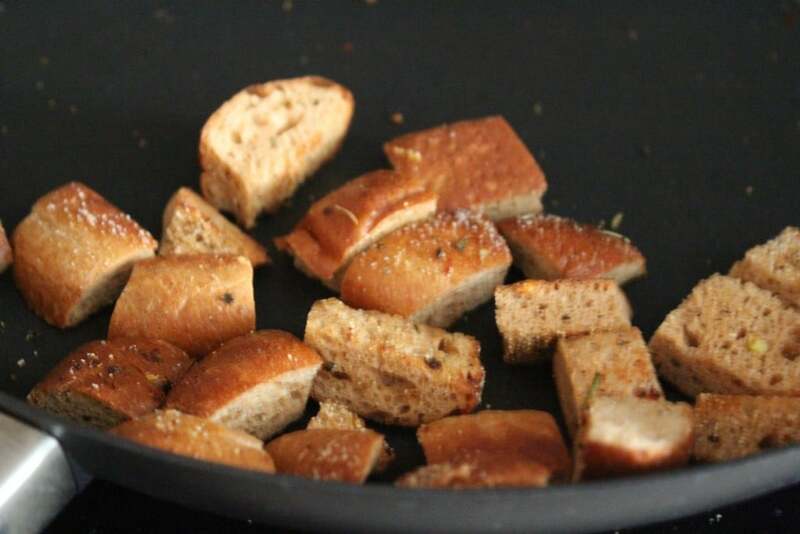 Place the croutons into a skillet at medium heat, prepared with cooking spray. 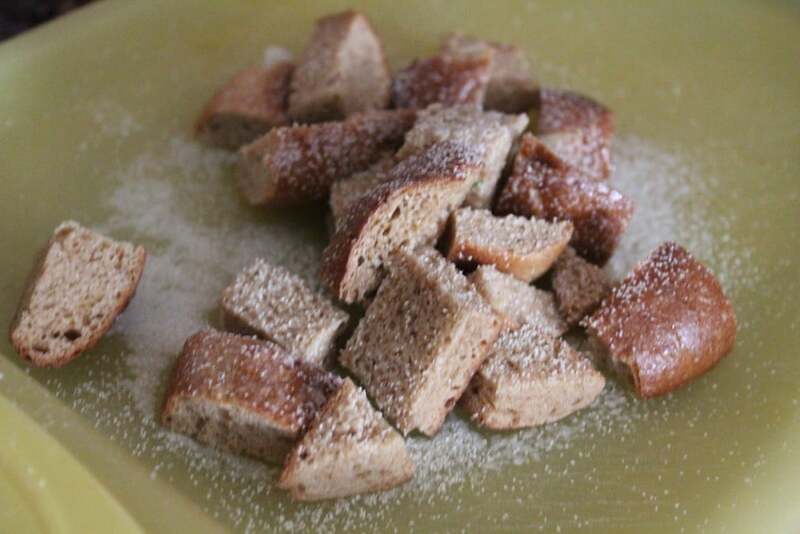 Keep your eyes on these croutons, stirring and cooking until they are toasted, about 3-4 minutes. Stir frequently to make sure they don’t burn! 6. 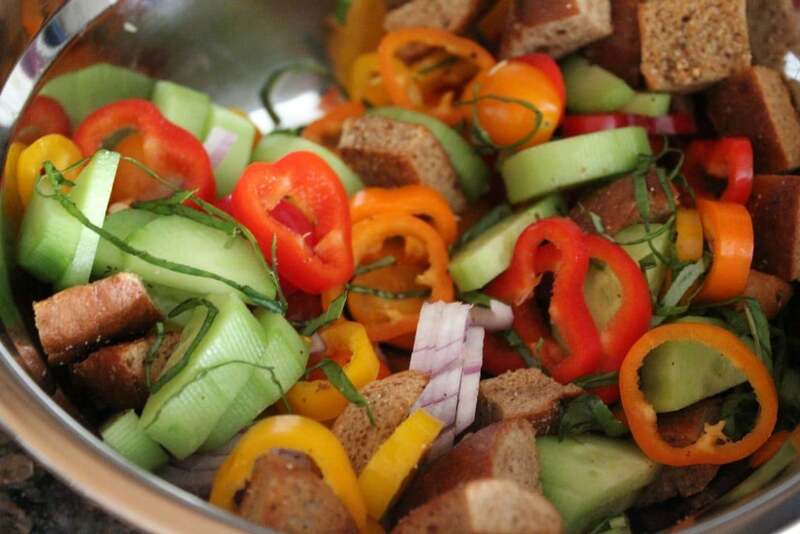 Add your croutons to the veggie mixture and toss with balsamic vinaigrette. 7. Cook your chicken patty in the microwave for 2 minutes. 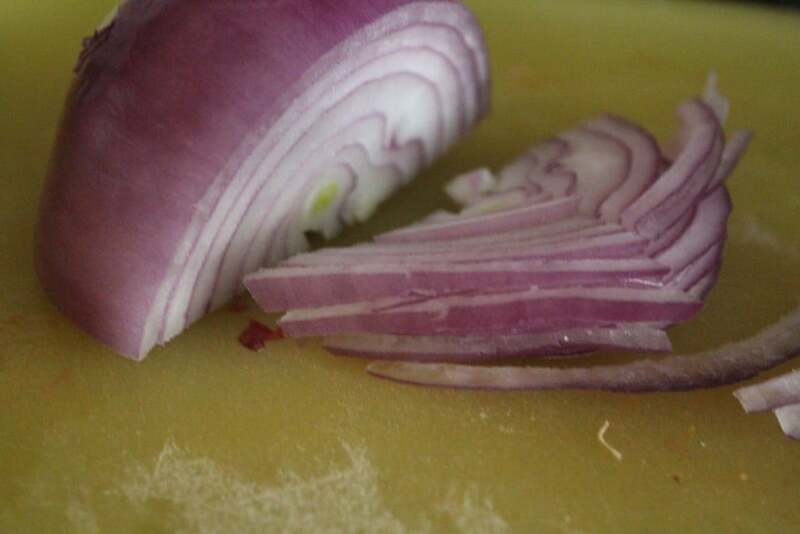 Remove to a cutting board and slice at a diagonal. 7. Place your sliced chicken on top of the salad, drizzling lightly with balsamic reduction.